A delicious recipe from Sandra Kemna in which she has processed Greensweet Brown and is made in a slow cooker. For 12 bowls of soup, 2 points per bowl (without baguette with gruyere and / or brie). Fry the onion rings with the garlic in the Becel for about 5 minutes in your removable slow cooker pan (if you do not, just put it in another pan), put the lid on the pan and let the onions simmer on soft heat for 15 minutes to become. Then add the Greensweet Stevia Brown and the flour and stir fry on a high heat for 10 minutes. Extinguish with the white wine and stir fry on high heat for another minute or 2. Then add the pot of onion base stock, the 2 liters of water and the 2 crumbled chicken broth cubes. Mix together and add the thyme and bay leaves (whether or not in a spice ball / egg). Set the slow cooker to low for 5 to 6 hours. Taste and add 3 tablespoons sweet soy sauce and pepper and / or salt to taste. To finish the soup, cut slices of baguette and toppings with brie and / or gruyère cheese and sprinkle with garlic pepper. Put them in the airfryer for 2.5 minutes at 180 degrees. 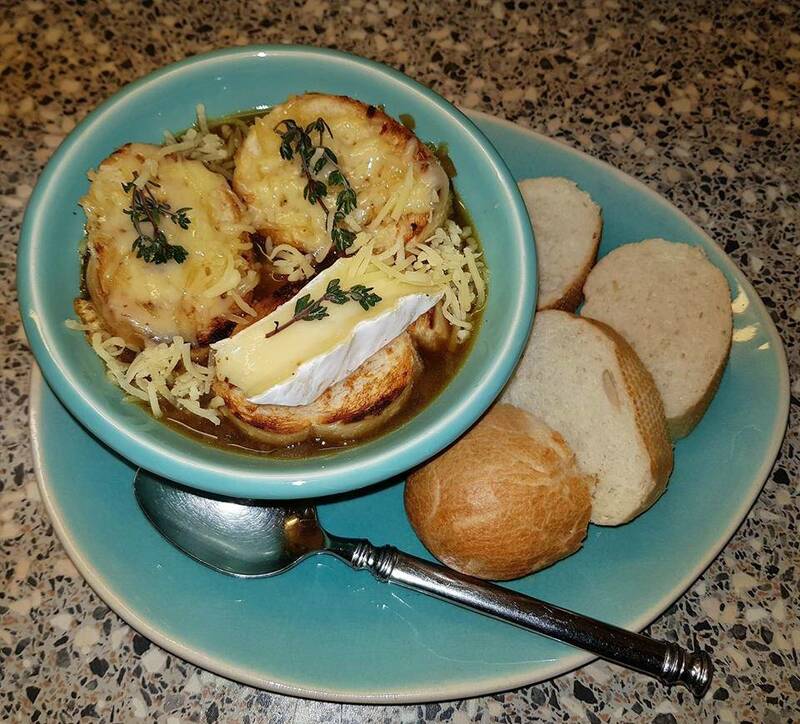 Put the soup in a soup bowl and put the slices of bread with the cheese on it.